Another website done and dusted! Because today, Webtron introduces a brand new state-of-the-art contemporary website for the rebranded Yarrawonga Construction and Maintenance business. YCM Homes services the construction needs of those looking to build a new home in rural Victoria and Southern NSW. As prices rise in our capital cities, and regional public transport infrastructure continues to improve, more people are opting to relocate to regional towns and cities. And so, growth in these towns are generally driven by strong local economies and competitive land and packaging prices in new estates. YCM Homes are your ideal professional housing and construction builders for your new housing developments in rural Victoria. With a new online presence, location is no longer an issue for the local Yarrawonga business. And with a brand new online presence, the business will be able to reach a broader geographical range of clients. 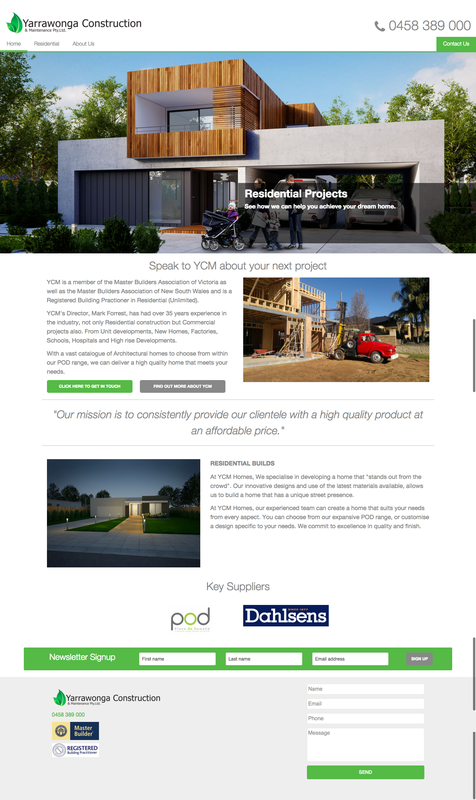 View the full website, and browse through their exclusive designer home range options at www.ycmhomes.com.au. Or maybe you’re looking for a website of your own? Get in touch with Webtron today.